We all already knew this. I have no sound, what did I already knew? How criminals already break laws, and adding another law will do nothing and as they argue it is a joke and they are more afraid of armed citizens then cops. They are deterred by weapons. Keensaw Georgia has 100% gun ownership and since the law requiring owners to all own guns crime dropped 70%. That many liberla statistics of "oh guns are bad" are inflated, and guns save many many more lives then they take away. That the DC handgun ban rose crime dramatically and since it was struck down in DC v. Heller crime plummeted. That culture, not guns kill people. That countries that ban guns see increases in gun deaths and other deaths while the ban is in effect. What do you do when guns get into schools? I mean Columbine like situations. Well there was already a ban on guns in the Columbine school so banning guns didn't exactly work now did it. The question is why pick schools? 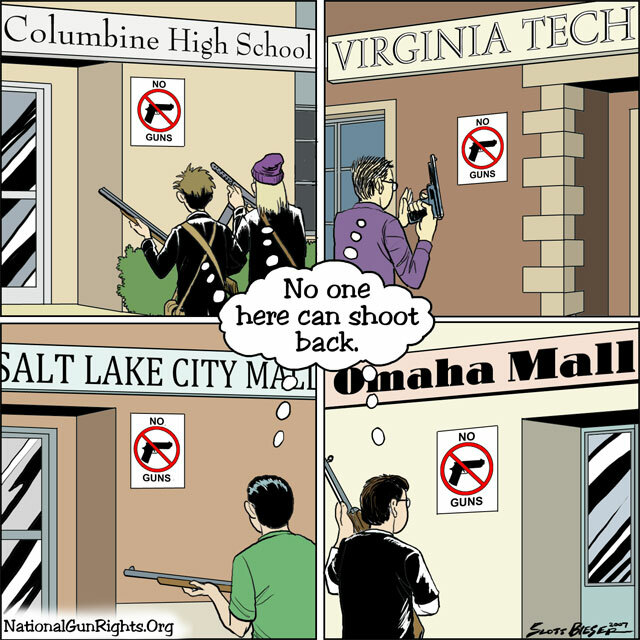 All gun free zones (schools, post offices etc) have had the largest mass shootings. Why? See the pic below. No deterrence no reason not too, basic criminology friend. Yes guns where already banned, my point. "criminals like gun control, makes our victims unarmed while we are still armed. Gun control is a joke" ~ LA gang member. Names hidden due to privacy. You mean like in the 1940's and 1950's when school shootings were unheard of? >.< They said "No one here can shoot back". Why is everyone in the politics forum illiterate? Dam, my sarcasm font is broken again. Blaming guns for Columbine is like blaming spoons for Rosie O'Donnell being fat. 1) Kids should be allowed to bring guns in school. Regardless of age, including the 6 year old that was the youngest school shooter in US history in my home state in Flint in the early 2000s. 2) Kids should be given mandatory guns. It will come out of property taxes. 3) The schools should have armed guards. 4) A combination of any of the above. I would pick #3. I don't want a mentally deranged kid holding a gun. Even if I had the chance to shoot back. I don't think schools should be firing zones. When did anyone say we should provide kids with guns? We're merely saying that it's not like gun laws stop kids from bringing in guns. I cold EASILY smuggle into my school guns, and not just a pistol, I could smuggle in a rifle, bombs, knives ect. If I really wanted to shoot someone, some rules not gonna stop me. Nobody in their right mind thinks everyone should have a gun. Do we give guns to babies? Do we give guns to people with no control over their motor skills? Contra, you are dodging the point. A sign that says 'no guns' won't stop someone who wants to kill people. Gun control works, just ask Nazi Germany, USSR, and other dictatorships! It is a proved fact that gun control increases violence. I understand. I support gun rights, I just think we should be more careful. No fully auto guns. For civilian purposes, it doesn't make a difference. Nobody is going to go around mowing people down with a M240 SAW. Nearly all shootings happen with pistols and/or shotguns. Fully auto guns are mostly for collectors, since they are ridiculously expensive. I'm not decided on what lines should be drawn or where. I'm saving up for a short-barreled shotgun and a short-barreled AR for home defense. It's scary how ineffective a pistol can be when it comes to stopping somebody, and shotguns are hard to maneuver. I want to be able to protect myself and my family how I see fit. Except this means that public automatic weapons (or public weapons at all) becomes ludicrous, because the only reason to have one is either to bring it to your home (which, assuming the police or judicial system works to any extent, includes a "reasonable belief" o.e. law to protect random searches), a shooting range (which is equivalent of previous) or to shoot people. But there is no reasonable justification to allow automatic, semi-automatic rifles or assault weapons. These should be made very hard to get, if not banned entirely. Handguns can help reduce crime. Assault rifles simply make massacres easier. Rifles do more than that. They protect you. Handguns have very little actual stopping power, especially if somebody is acting under the influence of certain drugs. Also, in rural areas a handgun is a poor way to defend yourself. Anyway, if you just ban rifles, the baddies will still get rifles. It's just the good guys that won't have access to them. So what you are saying is that handguns don't deter crime....contradicting all facts to the contrary. Prove that assault rifles A) don't do more harm than handguns when used by criminals and B) are significantly more effective than handguns at deterring crime. Once you do both, I can take you seriously. You don't need to prove whether it is more dangerous whether a criminal gets it or not, because a criminal can get it anyways. Legal or illegal. Second off, why should something have to deter crime for people to actually be allowed to buy it. Should I have to prove that debate.org should deter crime so that people can be allowed to use DDO? No, that's not what I'm saying. I'm saying that rifles are more effective at stopping a baddy than a handgun. Stopping power. Physical force. Hydrostatic shock. I can prove that rifles are significantly more effective than handguns at stopping a criminal. It's basic information for law enforcement and FBI agent training. If you really want to get into it, you can study ballistics of different calibers, see the hydrostatic shock factors, temporary cavity expansion, etc. If you are serious about home defense, it comes down to shotguns and rifles. I'll admit, it's a tough debate, but I don't want the government telling me that I can't have a short-barrel shotgun or an assault rifle.